My family and I decided to head out for about 2 hours to try some carp fishing, using just bread and corn. We were expecting to catch very few fish, since its the beginning of FEBRUARY. We should be ICE fishing right now. We decided to try out our "secret spot" in Willow Springs, and boy am I glad we did. My family and I decided to head out for about 2 hours to try some carp fishing, using just bread and corn. We were expecting to catch very few fish, since its the beginning of FEBRUARY. We should be ICE fishing rite now. We decided to try out our "secret spot" in Willow Springs, and boy am I glad we did. Im using a panfishing hook. Nothing big, thats how you get it to float. Tear out a circle in the middle of a slice of bread, fold it over the hook, and pinch the top so it doesnt fly off when you cast. Keep your bail open, and lets the fish run with it for about 5 seconds, then flip the bail so the line stops going out, and that basically sets the hook. it gets caught in its big lips, and ease the fish to the shore. Great time yesterday! I myself have never caught a Carp but I am very interested in knowing and learning what your secret is! Congrats! I am not much of a carp fisherman, but look forward to reading your response. My subdivision ponds are loaded with them and I think they would be fun to catch. 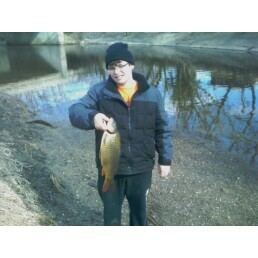 Very nice start to the 2012 DuPage Angler carp section. I would like to hear more on how you used bread as bait. What type / size hooks did you use? Did yo use a bobber?